Well I didn't qualify for the sprint which was disappointing. I could point to the fact that my calf was a bit sore, or that the EMIT without most recent version cards doesn't really allow for fast punching and I fumbled a couple, or that I was in the toughest heat (within 30 seconds of leader to qualify compared to around a minute for the other heats), but at the end of the day I wasn't fast enough and I missed out by 1 second. I ran well and I thought I had good speed. I missed maybe 10 seconds on 1 control but I was surprised to miss out. Today was much better. The calf was sore during the warm up, but felt ok on the course. I had a good race, lost around a minute and finished 2 minutes behind to qualify 8th in the long. Ran some of the course with Baptiste and Erik Ohlund. Times were much faster than expected, but the forest was nice, tricky in parts, but very fast running. Looking forward to the final tomorrow. Last night was the first race in the Stockholm City Cup, held in Humlegården near Stureplan in Central Stockholm. As you can see the area is tiny, the race was a bit contrived and still the winning time was under 11 minutes. I finished 4 seconds down on Anders Skarholt, having not missed anything really (pretty hard to miss in that park). Didn't really have enough grip on the wet grass in racing flats. Just looking at the splits, Anders and I had the same time at 16, but I lost 8 seconds to him from 16-19 and that was game over. 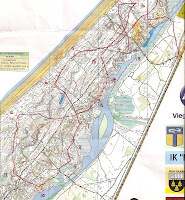 On Sunday I ran middle distance at Roslagen, was pretty nice. I was very scrappy. See map above and results here. Last night I won the Stockholm District Sprint Championships. My stomach was a bit bad during the day, but I felt good on the warm up and decided to run hard. 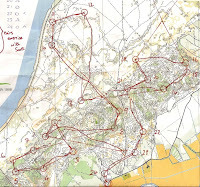 The course was good, with some interesting route choices and a good mixture of urban and forest orienteering. I was a bit scrappy on a couple of controls (3, 5 and 6), losing 5-10 seconds on each, but in general it was good and I chose good routes. I finished 5 seconds in front of Peter Hemmyr. On Thursday I flew to Riga for a short training camp with the British team. We based about 30km east of Riga in some cabins really close to some fantastic sand dune terrain (see some map samples below). We also did a session with a couple of the Norwegian team which was good. 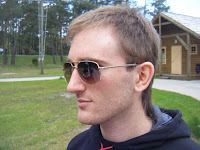 So what did we learn about Latvia (or at least the terrain near Riga)? Fast, vague in places, but the dunes can also be large and obvious. Where it is sandy it can be really sapping, and it will be very easy at high pace to lose contact, especially on the longer legs. I can't wait for EOC! Here are some other cool trainings from last week, a large scale sprint and a really technical forest north of Stockholm.